"Home textile decision-making reference report " mining data trends, cluster brand effect. "Home textile decision-making reference report" is positioning on market research report category of publications. It is focusing on home textiles consumer market, circulation channel research and home textile economics analysis. The main contents are textile business district involved in research, consumer surveys, and foreign trade index analysis. The readers can get a wealth of Chinese home textiles information and details through accurate data and professional analysis. 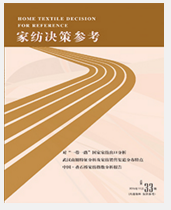 The “Home textile decision-making reference report" main readers are clothing and related business decision-makers, senior management; governments; clothing professional market; all levels of textile, clothing industry associations; University library and so on.